Played Friday night after work, trying to get in as many holes as I could before the rain arrived. No. 8 at my course is a blind shot into the green. You have to hit it a little left as everything funnels right when it hits the ground. Because it was into a good bit of fan, it was a 7-iron on this evening. When I hit it, I felt like it was going to be fine, but wasn’t 100 percent sure I got all of it. I figured it was probably going to be on the green, but wouldn’t have been shocked if it was a little short. Walk over the hill to the blind green and didn’t see it anywhere. My playing partner asked if I thought it was over the back and I told him I didn’t think I hit it well enough for that. As I walked toward the right side of the green, I took a quick peek into the hole. Yep, an eagle 2. 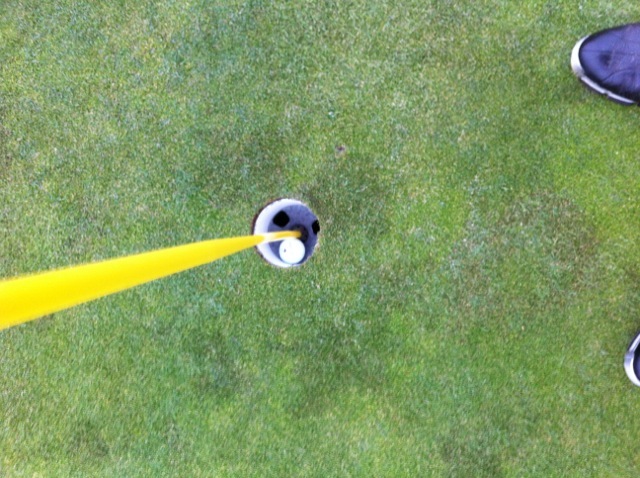 I’d love to say that I saw the ball go in the hole or that I hit a high shot that spun back into the cup. But I have no idea how it ended up in the hole. All I know is that I made a two. Not going to complain about that. Do you agree with me that the hole would be even better with some fairway-length grass all up the left side of the green? The hole was middle and a little left of center. I did walk up from where I was in the fairway to see where the hole was, but I had no idea that it went it. When I walked up, I expected to see it on or just short. When I saw nothing, I knew there was a chance it went it. Would it be cool with fairway on the left? It would be kind of cool. But with the amount of slope there, I’m not sure it would change much. It seems pretty tough to get a ball to stop up there in that rough. Balls just bounce right.